Yesterday in the Dubai Gold Cup, we saw the winner appear to cause interference, but the owner of the affected horse, withdrew his claim. "Prior to correct weight, Jockey S De Sousa (CAVALRYMAN (GB)) 2nd placegetter, lodged an objection against the winner CERTERACH (IRE), alleging interference from passing the 200 metres. During the objection hearing trainer Mr S bin Suroor (CAVALRYMAN (GB)) requested to withdraw the objection." "Jockey J Spencer (CERTERACH (IRE)) pleaded guilty to a charge of careless riding under the provisions of ERA 69(i), the particulars of the charge being that passing the 200 metres he allowed his mount CERTERACH (IRE) to shift in when not clear, causing CAVALRYMAN (GB) to restrain. Jockey J Spencer had his license to ride in races suspended for 2 race-meetings (provisional dates being the 7th April 2014 and 8th April 2014." Lucky this wasn't in a "pari-mutuel" jurisdiction. In that case, bettors (justifiably) would feel cheated. There is a school of thought with regard to leaving a result as is, and working out the details later for horse owners and participants through placings and suspensions. A lot are fine with that; it will speed up the betting game, there will be no ten minute inquiries, etc. In this case we saw a result stay as is, but perhaps only because an owner withdrew a claim. No one said policy was easy. Needless to say I guess, we agree with @docfonda. Agreeing with this does not mean we don't respect participants and owners and trainers and grooms - in fact, many horseplayers are participants and owners and trainers and grooms - but it's just simple logic. Customers bets pay for purses, and purses allow racing to exist. @CVFPartnerships @JBossertNYDN @TheNYRA Bettors put on the show. Without them there would be no purses for any horsemen, small or large. So, there is no business without customers. Customers "put on the show" with their purchases. Are we clear? Related: Caton Bredar on "Horseplayers"
This article by Barry Meadow appeared in the December edition of Horseplayer Monthly. To read the March 2014 issue with 32 pages of handicapping interviews and insight for free, please click here. A trainer wins 18% first off the claim. A handicapping system hits 29% winners. A jockey's year-to-date win percentage is 6%. Will any of these stats, or others, help your bottom line? Or will they simply mislead you? Until William Quirin's Winning at the Races was published in 1979, few handicapping books offered much in the way of statistics, mainly because compiling them was an exercise in tedium. You'd have to buy every Racing Form, every day, and then go through each race searching for some characteristic you wanted to research. When you finally found a qualified selection, you'd grab a different Form to check the chart, and then record each result. Doing even the simplest work took incredible patience, or a staff of unpaid students. All that changed with the introduction not only of the personal computer, but more recently with the availability of daily downloads. Now, for just a few dollars a day, anyone can download every past performance line for every horse in the nation, write a simple query, and find out if horses really do yield a flat-bet profit if they return in exactly five days (they don't) or whether you can make money by playing every dropper from a straight maiden into a maiden claimer who showed early speed last out (ditto). The gathering of horsey data is no longer much of a problem. Ask the computer a question, and it will spit out answer. However, while accumulating data is one thing, interpreting it correctly is something else altogether. The essential problem is that while ideas should be forward-tested (you state a hypothesis, then test it), many data miners work backwards, falling victim to what is known as "hindsight bias." They start with already-known results, and then look for patterns that might have contributed to these results. Typical: A player notes that many recent winners at his track were dropping in class, so he decides to check the last three months' results. Sure enough, class droppers did well, but because the survey includes the recent results that he already knows, his sample will be skewed. * The larger the sample size, the more likely will the percentages be accurate. Conversely, anything goes when looking at tiny sample sizes. * The less often a result occurs and the higher the payoffs, the greater the sample size you need to measure the validity of the idea. * Unlike groups cannot be lumped together: 3-5 shots cannot be lumped in with 7-1 shots. * Check the actual number of plays, not simply the number of races investigated to obtain those plays. * Rules that appear arbitrary (horse's last race must have taken place within the past 21 days, horse must go off at odds of 5-1 or above, etc.) indicate that the system came from back fitting with the arbitrary rules added to get rid of a bunch of losers. * Whenever an idea has been developed from one set of results, it must be tested on a completely separate group of results. is merely recorded and not proven, you cannot accurately predict the range of results since you do not know whether the result is typical or atypical. * Return-on-investment statistics are often skewed by a handful of longshot winners--sometimes even by one such winner. * Any study of race results should look at what the usual results are for the particular odds category, and compare the usual ratio of wins, places, and shows to the results in question. 1. Could it be false? Years ago, betting every favorite lost only half the track take. However, my own survey of 400,000 more recent favorites showed conclusively that you would lose the full track take by betting every favorite today. Yet some authors still continue to mistakenly tell their readers that the old stat is still valid. A man touting his own system might tell you that it had an ROI of 37% last year at Belmont. Nice (if it's true), but what about every other track? Did it lose everywhere except Belmont? Often, it's the information that isn't being revealed that it is the most revealing. 3. How many plays were there? A sample size of 1,000 plays for a system whose average winning payoff is $24 is just about useless. If a guy tells you he bet 417 longshots last year and showed a 15% profit, don't be surprised if he does the same this year and shows a 30% loss. 4. How was the number derived? Who compiled the numbers? How far back? Which tracks? What were the odds? What was the 1-2-3 record, and what was the expected 1-2-3 record for horses at those odds? 5. If an ROI figure is not included, is the number of any use? If a stat has an impact value of 2.3 (horses with characteristic win 2.3 times their fair share of races), that's good--but if they average a $3.80 payoff, who cares? 6. If an ROI figure is included, how many plays is it based on, and did a few big payoffs skew the results? A 500-play report that shows a 7% profit is worthless if its two biggest winners accounted for all the profit. 7. Is it possible that the result is simply a fluke? If horses from post 6 showed a net profit for a particular meeting but posts 5 and 7 were losers, it's likely the result is nothing more than a statistical anomaly. 8. Have others, using different races, found similar results? If you based a method on the results of certain races, you need to test it on different races - as many as possible. Better yet, have somebody else test it. 9. Is there evidence that the tested factor was more successful than can usually be expected, less so, or about average? That includes not only the win percentage, but whether the prices were better or worse than usual. These are starter questions. If you really want to get serious about the subject, study books like How to Lie with Statistics (Darrell Huff), Fooled by Randomness (Nassim Nicolas Taleb), Innumeracy (John Allen Paolos) and Statistics for Dummies (Deborah Rumsey). Don't believe everything you read - even if it's got a number attached. The Commission will also reach out to the New York State Racing Fan Advisory Council and to the wagering public to develop further recommendations on how best to increase transparency and public confidence. As supporters of our equine athletes (in case you missed it, a HANA handicapping contest winner is playing for horse retirement in April at the WHHC), this gave us a Sunday smile. We hope it brightens your day, too. This interview with Mark Midland appeared in the October edition of Horseplayer Monthly. To read the March 2014 issue with 32 pages of handicapping interviews and insight for free, please click here. Mark Midland is CEO of Derby Wars and HorseRacingNation. Derby Wars is a horse racing game combining skilled tournament play with a social game experience to appeal to both tournament veterans and casual fans. They offer games with entry fees for as low as $1 all the way up to $475 entry fees. Mark has over 15 years of horse racing marketing experience having held executive positions with Churchill Downs Inc., Harrah’s and Youbet.com. Mark has a track record of innovating new products including the Kentucky Derby Future Wager (1999), establishing 20-horse wagering in the Kentucky Derby (2001) and the daily guaranteed Pick 4 at Hollywood Park (2003). Q: Why did you create DerbyWars? and have you seen tournament players embrace it since your launch? 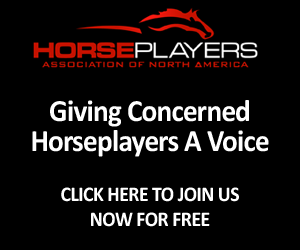 A: We had launched HorseRacingNation two years prior, and we were very excited about its growth, but we knew in this industry it would take time to grow, so we were looking for a second opportunity. 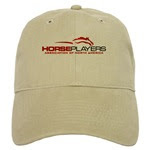 We are all horseplayers and we’ve seen tournaments as an exciting and growing part of racing the last few years. But we wanted to do tournaments better than anyone had done before. We took a look at Facebook games, mobile games – and said, let’s set a higher standard for the fun & engagement of tournaments. And that’s what became DerbyWars. We started building DerbyWars in January 2011. We actually had it ready to go in May 2011, but we weren’t happy with the final product. 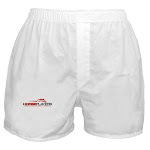 So we scrapped the design completely and went back to the drawing board, launching in October 2011. So with the start of Keeneland, DerbyWars is now two years old! Today we’re running about 60 separate games a day on racing 7-days a week! We’re thrilled with the response we’ve received from players. Q: This space seems to be growing in popularity. Why do you think it is? A: I believe there are several reasons for the growth of contests. First, you get a great run for your money for a single investment. Plus, you can invest a little and win a lot. But it’s also simpler. When we hold our $10,000 contest every Saturday, there are 67 entries and someone is walking away with a $5,000 first prize. There’s a rush of adrenaline as you compete for 3 hours. Playing the races is great, too – but you might put $120 into a Trifecta only to have it pay $100. In contests, the prize is clear. A site like DerbyWars offers dozens of games every day – so you can choose the size of your investment, the number of players and what you’re trying to win. Q: Online poker players have long been accustomed to “free play” or “cheap play” tournaments. Do you feel this is a way to attract that type of market, and possibly increase racing’s reach with newbies, or poker players? A: Yes, smaller entry fees are an exciting component of tournaments. Everyone loves to enter for a little and win a lot. 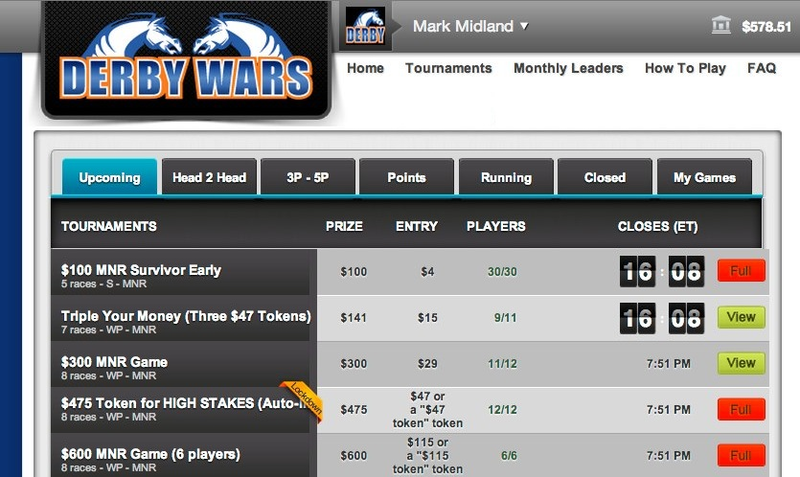 DerbyWars features games every day that you can play for free or as little as $1 or $2. To get a couple hours entertainment from a $2 contest entry – we think that’s pretty cool! But one of the most exciting things for us in launching DerbyWars was seeing how readily newer racing fans embraced tournaments. When you think about it, tournaments are much simpler than betting at the windows. 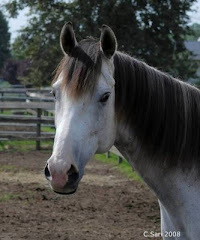 You don’t have to figure out what bet, how much, which horses and how to structure it. You simply have to pick a number. 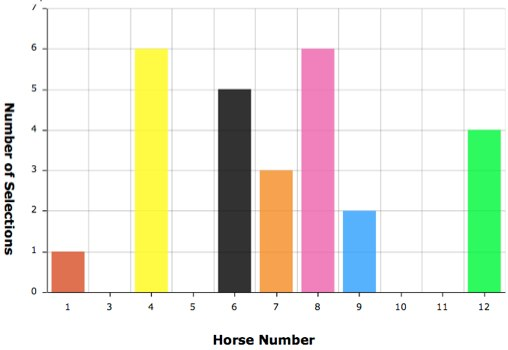 So you pick the 4 horse, and you see that 3 other people in your game picked the same horse – and you realize – that maybe you do know a little about what you’re doing. It’s just so much less intimidating. With the simplicity of contests, we see that we’re converting new customers to racing, and that’s tremendously exciting for us. We’ve also seen that we’re converting new players to contests. For example, Eric Moomey, a top tournament player, had never played tournaments before DerbyWars. Q: What are your most popular games? A: Our $10,000 Saturday game is very popular, and every Sunday we run a $5,000 High Stakes game with only 12 players. The response to the High Stakes has been tremendous and we’re now running it on both Fridays and Sundays during Keeneland. Other popular games include Head-Head Games, where you take on one other player, usually on just one race card. It’s an entirely different strategy than playing in a big tournament; it’s all about picking winners and staying ahead of your competition. Head-Head takeout can go as low as under 7% for our $800 Head-Head games. The other thing about Head-Head games is that it’s very much about your competition as well as the races. We also have daily Survivor games that are very popular, plus a Lockdown feature where all picks must be in ahead of the first race, which is great if you can’t play live race-by-race. Q: How many games do players have to choose from on any given Saturday? A: We’re running about 75 games on the typical Saturday starting around 12:30 ET and running to nearly 9pm ET. Q: Any advice for someone playing for the first time (stakes, type of game, etc)? A: The best way to get started is to set up a free account and get 1,000 points for free to get started. When playing for money, the best place to start is in Head-Head games and small 3 to 5 player games. Those are great way to start competing and start winning! A: Thanks for the interview! We enjoy supporting HANA and look forward to hosting our third annual HANA – DerbyWars game this spring! Last week a man had a Rainbow Six ticket that he took for $1. He was close to a pool shot, but never had the chance. Despite him having it on one ticket, which is the supposed "rule", that ticket was taken, technically, for 5 times the base amount. No winner, even if he was the only ticket. Today, races were taken off the turf due to the massive storm that hit south Florida. Those races, in the Rainbow Six sequence, were considered "alls". "Alls" in a hard to hit (some might say near-impossible to hit at these levels) bet are not even a bet at all. No one had a remote shot to hit the Rainbow Six today, and it brought in hundreds of thousands in handle. If someone hits the Rainbow Six on one ticket, regardless of denomination, it can be argued that it's fair he or she takes home the prize. If there are "all" races in a sequence due to, say for example, two or more off the turf races, one might argue a refund is in order. Buyer beware is fine. But we have to remember, the Rainbow Six is trying to capture new lottery-type players, and perhaps some new fans. Being fair is probably something that should be considered. As we embark on tabulating the 6th Annual HANA Racetrack Rankings, we were having a discussion about how the rankings exhibit horseplayer "value". That's a tough word to quantify, but if you understand gambling only a little bit, it can come naturally. The gentleman who hit the Black Gold Pick 5 mentioned today, even with that bet, he was seeking value. "“There were some days when there were some small fields or lots of favorites that I thought would win, and I would sit those days out ...." he said. He found no value. Value can come from carryovers (which are simply a takeout reduction bet), low takeout, higher field size; many things. Reading back to the California Players Pick 5 - the bet that was initiated at the behest of primarily horseplayer Andy Asaro, in the throes of massively declining handles after the takeout hike in 2010 - the concept of value comes full circle. "The low-takeout (14 percent) pick five that made its debut Thursday at Hollywood Park attracted a modest $103,291 pool. Is it a good bet? You be the judge. 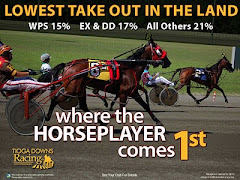 California recently hiked takeout to 23.86 percent for exotic wagers with three or more horses. Under the standard takeout, the winning pick five Thursday would have paid only $233, compared to $263. Under standard takeout, the amount removed from the pool (the takeout) would have been $24,459 compared to just $14,460. Bettors on Thursday received a "bonus" of nearly $10,000. A bet that would have paid off at 466-1 odds, instead paid 526-1. " Some in the racing industry will lead you to believe that this increase in payouts (which is what lower takeout is) does not make a difference. This "value" is too small to change behavior. Four years hence, the lower takeout pick five does not handle $100,000 like it did day one. It can handle five times or six times as much. In fact, there is a possibility this Santa Anita meet will be down in overall handle (even with the carryovers and all their good weather this winter), while the pick 5 will be up millions of dollars. Do horseplayers seek "value"? You bet they do. They do each and every day. The 6th Annual HANA Racetrack Rankings, with updated, sortable statistics on takeout rates, field size, signal availability, handle size and wager variety, among others, will be released in the April 2014 issue of Horseplayer Monthly. This interview with Mike appeared in Horseplayer Monthly. To read the March 2014 issue with 32 pages of Handicapping interviews and insight for free, please click here. To follow Mike on Twitter, he's at @silk1900. Mike Maloney of Lexington, Kentucky, is one of the select few horseplayers in the sport who derives his living from wagering. He does not have a fancy computer team behind him. He does not write complex algorithms, or have a system robotically looking at the pools. 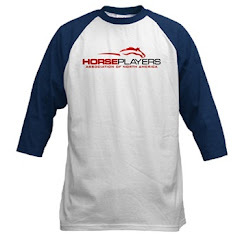 He’s a good old fashioned, hard-working horseplayer, just like a lot of you. Mike is also extremely pro-racing and pro-horseplayer. He was involved with the NTRA Players Panel, and is a HANA Member, who served as a Vice-President. We thought we’d visit with Mike to get an idea about how he goes about his day. Perhaps some of his thoughts can help you at the simulcast center or racetrack. We thank Mike for taking time out of his busy day to share his insight. 11:00 A.M.: “I only live about ten minutes from Keeneland, and during that ten minute drive I tend to gather my thoughts for the day. I handicap myself more than most I think, because my past results show money management is something I need to constantly work on. "One thing I want to do on the drive is get into my mindset of my betting limit, which is what I can lose for the day. If I approach that betting limit I know I have to cut my bets down or stop betting all together. My betting limits change depending on how I am doing, and they help me a great deal. Having a philosophy where I cannot get too worked up, or go on tilt, is very important to me as a horseplayer. "I also want to think about what tracks I may play, the weather, the bias in my bias notes, whether I have any watch-list horses I want to structure bets around, or if there is something unusual I want to remember, like a carryover in a certain pool." 2:00 P.M.: The close of the early cards. “If I am comfortable in making a larger play, I head to the windows. I could be betting a pick 4 or pick 5, or just the race itself with verticals. I’m comfortable with my ticket structuring because I have been doing this for so long. There are only so many ways to play a race, and I have about 20 different structures based on the size of the field, horse, or bets available. When I am reading off my tickets to the teller I am barely thinking about them, and I can keep an eye on the monitors for any changes or races going off at different tracks. It’s multi-tasking that has become second nature. “How I approach the last several hours of the early cards is dependent on what I mentioned earlier: my betting limits. If I am up a certain amount, I will adjust the limit so I take losing out of the equation. If I am down close to my limit, I may make a couple of plays and if they do not succeed, I am done for the day. We as horseplayers tend to be compulsive and we love the thrill of picking horses, but that can get in the way sometimes. 4:00-7:00 P.M.: “At this point of the day I’m settling down from my prime cards, and watching the early races at a late track, or watching the last several at a Midwest track like Arlington. I have probably been watching Arlington closely, and I want to remember if horses I thought would race well did, and if there is any bias I can take advantage of for a late carryover bet, like a Super High Five. “Usually around 6 P.M., if I have no spot plays I am interested in, or the late cards have nothing too interesting, I close up for the day. This involves up to an hour of doing my taxes, making my trip notes, and updating my database. At times I will print out the past performances for the next day and have a quick look at them. “At around 7 I probably head home, or meet someone for dinner. I unwind for an hour or two and then head back to work on tomorrow’s cards. Sometimes, if I am in the right mode, I can handicap for a few hours to get ready. On off days [generally Monday and Tuesday for Mike] I may spot play, or work on my speed and pace figures.